is classically styled, and will dress up any baby’s kingdom. The high curved back rises to just over 4 feet and lends a stately feel to this crib, that is sure to please your eye in even the smallest of nurseries. The vertical stature of this crib is really eye catching, and with its versatile conversions make it easy to see this gorgeous crib growing with your child right into adulthood. The Davinci Jayden 4 in 1 crib is JPMA certified as meeting all safety standards required for cribs. 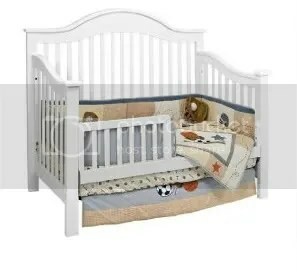 It has 4 levels of height adjustment and converts from crib, to toddler bed ( guard rail included ), to a day bed and a full sized headboard, although the full sized bed frame and mattress is Not Included. which is also Not Included. Made from 100% Solid Wood - NOT plywood & Veneers like other rails! The DaVinci Jayden Collection has several style pieces that would coordinates perfectly such as the Jayden 3 Drawer Changer and the DaVinci Jayden 4-drawer Baby Dresser. It is available in 3 finishes, the white as shown here, as well as a rich Ebony or warm Espresso. This crib also comes with a 1 year limited manufacturer’s warranty against defects.